Senior executives have a healthy appetite for a wide range of traditional and new media channels, according to a survey from Doremus and the Financial Times: Most surveyed execs still read business and trade information in printed formats, but they also use digital channels—such as online video, professional networking sites, and blogs—for work. 65% use professional networking sites such as LinkedIn and Plaxo. 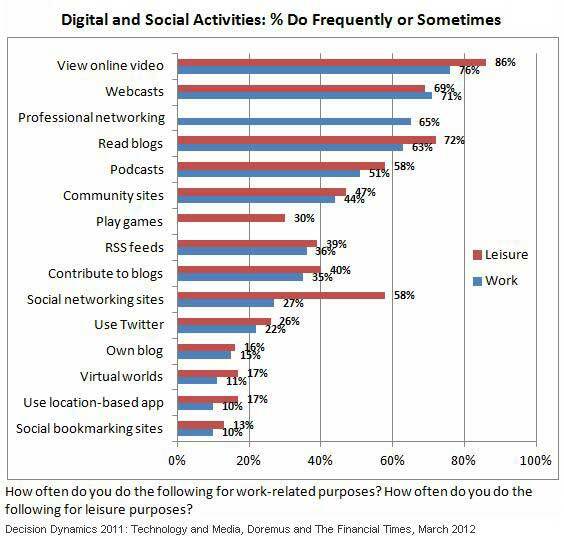 Nearly six in ten executives (58%) use social networking sites for leisure, but only 27% do so for work purposes.